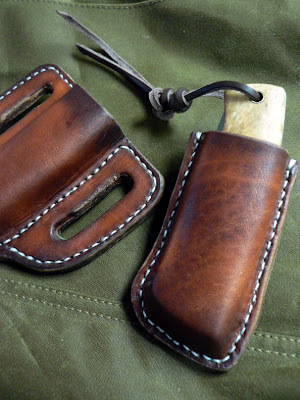 Damn Yak Dry Goods Co.: Custom Drop Sheaths. Tim and Chris of COEC asked me to make two different sheaths for their matching knifes. I am a fan of drop sheaths, their simplicity and lack of snaps and buttons make them fool-proof and durable. These bad boys are made form 10 oz tooling leather. They were wet formed over the knife and then stitched to the backing. Wet forming is when you soak the leather then place it over the item, and stretch it while it dries. I lay it on a slice of log and tack it down tightly around the knife (or any object) while it dries. This insures a custom fit! They leather, after dried and stitched is treated with a blend of waxes. My treatment for sheaths is 65% beeswax, 35% paraffin, this is a good balance of stiffness for the sheath, and for a good measure I threw in a dollop if Damn Yak Pine Pitch Salve for a bit of oil and the grip of pitch. 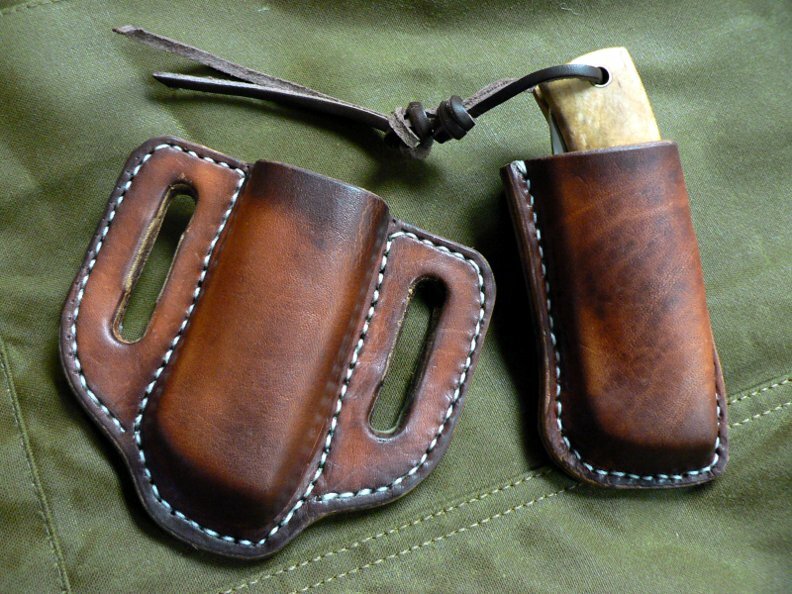 I like the idea of the "Pancake" Sheath, this was the first time making this type of sheath, its tight to the body and does not get caught on thing as easily as a regular sheath would. The initial fit is super snug, but with use they will loosen up appropriately. These sheaths should provide years of hard use and dependability. Can't wait to see them in a 6 months, to see how they have weathered.